Now use language to describe your idea to a group of no more than three people. Ask them which ideas they think are the best and why. Ask them if they have some possible solutions to any problems there might be. Can they suggest solutions and means of finding them? Ask the group if they are familiar with any artists or inventors that have done something like this before. Research these artists online and in the library. Do not skimp on this step. Do a search online in the patent office. http://uspto.gov/patft/index.html. Try and really dig into this aspect of the subject, as it will inform you how to later think and write about your project. Take the suggestions of your peers, classmates, or artist friends, and if their notions ring true, incorporate these into your project design, but at this time start to think about how the project will be constructed. Pay attention to which materials you will want to use. What are the implications or cultural languages of that material? Even if you do not like the ideas your peers put forth, give their thoughts and questions careful consideration, as their knowledge may have bearing on your works, and they may be seeing something that you are not. Remember, though, this is your work and you can take it in whichever direction you feel is correct. Now make more refined drawings; many. Treat your original drawings as rough sketches from which to base your more refined drawings. Act as if you are taking a magnifying glass and looking at each point in your invention/artwork and sketch out the details. Mundane things like how deep the screw needs to go in order to properly grab plywood. Or will you use glue as opposed to screws to make connections and will this be strong enough in the user environment. What are the mechanical linkages you expect to create and will you have the proper strong materials to transfer the turning of a motor shaft for instance to a lever or cam? The work will always break at it’s weakest point and I cannot tell you how many works I have seen broken because artist/inventors do not use mechanical shaft couplers. Even epoxy or super glue, which is very strong for certain connections, should not be used to make mechanical connections. What are the parts you will need? This is often the most difficult part of the project, as finding the right part is challenging and can take a very long time. I have found myself wandering the aisles of home improvement stores for hours, as well as doing extensive online searches. Do not underestimate this stage if you are under deadline. Start immediately to look for parts that represent real workable solutions and test these parts in mock-ups of the project. Often overlooked is what kind of wire will you use. Choose the wire that is dictated by the user environment first and then by the aesthetics second. If you need wire to bend multiple times, think about how the fatigue of bending the copper will cause it to break over time. 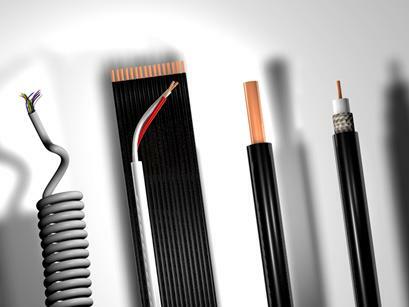 Image of wire and conductors. What are the skills you will need to acquire in order to complete this project? How long do you have to get these skills? What existing parts can you utilize in your project that may already exist that will not challenge your idea? This last question is the most important, as it reflects the primary approach I recommend, which is to use pre-existing kits or products to realize your project. It is not necessary to fabricate everything from scratch and it is often best to use existing circuits and subsystems of other systems to realize your idea. Remember if you do not find this site then Google the key words for the new address. The media Artist Fernando Orellana used this approach in his work "8520 S.W. 27th PL" 2004, which is an installation about our pointlessness and never ending, decision-making processes. In the artist words “choosing between left or right, brown shoes or black shoes, K-mart or Wal-mart.” The work is constructed of rewired and reworked dancing Hamster Toys. 8520 S.W. 27th. Place by Fernando Orellana. 2004. Photo by Mindy McDaniel. 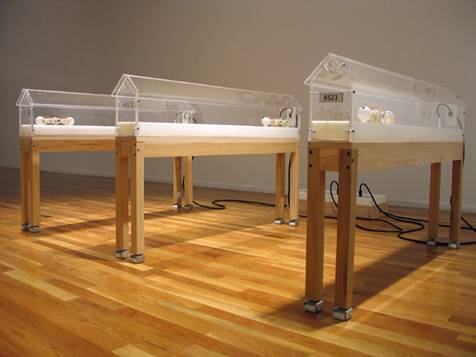 In the installation, eight double-headed robotic hamsters live in identical houses that are narrow and transparent. The houses are plugged into individual monitoring stations and are numbered with a unique numerical address. 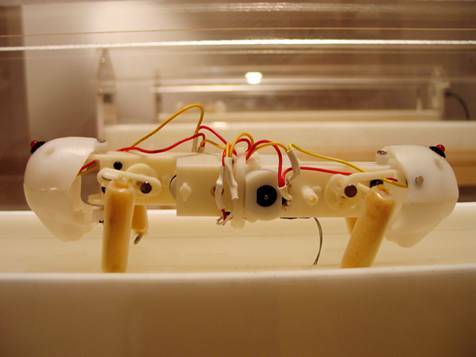 The robotic rodents have the ability to run about in their houses but in only two directions. This becomes a witty commentary about the nature of decision making itself. Orellana used infrared sensors to monitor the activity outside the houses, this information is gathered and processed through a BS2, and from this observation helps the rodents decide which new direction to run in. The work is akin to our mental decision process in that the sensor system permits external forces to influence each new movement the robot make. Are the means and materials by which you have chosen to express your idea appropriate to the idea? Do you have enough technical skills to realize your ideas, and if not, is there time available to learn the skills? Can you find collaborators or technical people to contribute to your project? Are they reliable? Are you good at getting others involved and acknowledging them in the process? 1. Have you left a place for heat to escape from your hot electronics? 2. Can children or unsuspecting adults accidentally get a shock from your project? 3. Can it hurt someone? Be very careful at this stage as we live in a litigious culture and lawsuits are very unpleasant and expensive.